Precious metals futures closed sharply lower on Tuesday. Gold and silver posted fresh one-month lows. Gold dropped the most, and extended its string of losing sessions to four in a row. Gold for December delivery tumbled $21.80, or 1.9%, to settle at $1,114.10 an ounce on the Comex division of the New York Mercantile Exchange. The close was the lowest since Oct. 1. 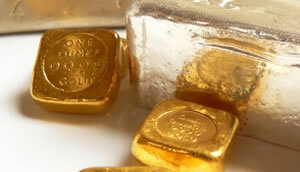 Gold prices traded from a low of $1,113.60 to a high of $1,138. They lost 0.5% in the prior session. Silver snapped its two-week riding streak of up and then down daily closings, but did so by falling for two straight. Silver for December delivery fell 17 cents, or 1.1%, to close at $15.24 an ounce. The settlement was the lowest since Oct. 1 when the precious metal finished at $14.51 an ounce. Silver prices ranged from $15.20 to $15.45. On Monday, they declined by 1%. "The silver market is under pressure, along with gold, due to the new language introduced by the Fed last week," Bloomberg News quoted Bob Haberkorn, a senior market strategist at RJO Futures in Chicago. "With the threat of a rate increase in the coming weeks, it will be pretty hard for silver and gold to rally." January platinum turned down $16.20, or 1.7%, to $962.20 an ounce, trading between $960.40 and $984.40. Palladium for December delivery shed $6.35, or 1%, to $644 an ounce, ranging from $640 to $655.10. Gold declined $10.90, or 1%, to $1,123.10 an ounce. Silver dropped 25 cents, or 1.6%, to $15.38 an ounce. United States Mint bullion sales advanced with 4,500 ounces in gold coins and 763,500 ounces in silver coins. The U.S. Mint has limited sales of bullion American Silver Eagles since temporarily running out of them in early July. The agency allocated 1,187,000 coins for this week, and now 423,500 of those remain. Silver Eagle sales hit 40,606,000 for the year, up 5% through the same time in 2014. Last year when sales ended at an annual record totaling 44,006,000, the coins by Nov. 3, 2014 logged sales of 38,666,000. Below is a listing of United States Mint bullion products with the number of coins sold during varying periods. Products with an asterisk (*) are no longer available.